Google Nexus 10, the new tablet manufactured by Samsung, has become the most impressive and fastest Android tablet this year. Moreover, its screen is even sharper than the Retina Display on iPad and most importantly, the price tag is $100 cheaper. 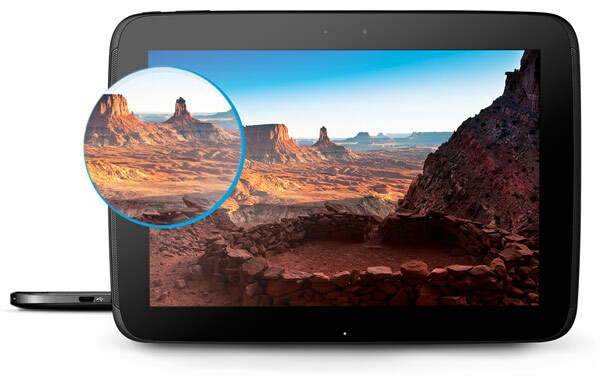 The Nexus 10 is running on Android 4.2 and priced at $399 for 16 GB or $499 for 32GB edition. It also features cutting-edge technologies such as the the brand new Samsung’s dual-core 1.7Ghz Exynos 5 processor, the first chip in a tablet using the ARM Cortex-A15 architecture. Probably the most impressive feature of the tablet is its huge and super high definition display. I am pretty sure that all consumers will get excited with the screen, it even out-pixels the new iPad 4 (Nexus 10’s display is 300 ppi while the iPad 4 is 264 ppi). If you are still considering between Google Nexus 10 and others, you will be convinced with the first reviews of the tablet. I am collecting reviews from some popular tech sites, check them out and hopefully they will help you get the best decision. Awesome screen with insanely sharp text and vibrant colors. Performance is very fast and smooth. Android ecosystem is lacking of apps to take advantage of the huge, high-res screen. High-res screen clashes with some low-res Android graphics. Design and build materials are not as good as Nexus 7. No micro SD card slot, can’t expand memory further than 32GB. The screen is offering slightly muted colours and contrast ratios. Very affordable $399 price point. Stellar battery life (nearly 2 whole days of normal usage). Highest-spec tablet on the market. Impressive screen, good audio, very fast processor. Android 4.2 is mature and usable. Few apps developed for high-res tablets. No 3G and LTE connectivity. What do you think, will you order a Nexus 10 to replace the iPad? Google Nexus 10 is really better than iPad or Galaxy Note. It has powerful processor, I feel it’s faster than iPad 2. Your review is very good, thanks for sharing.